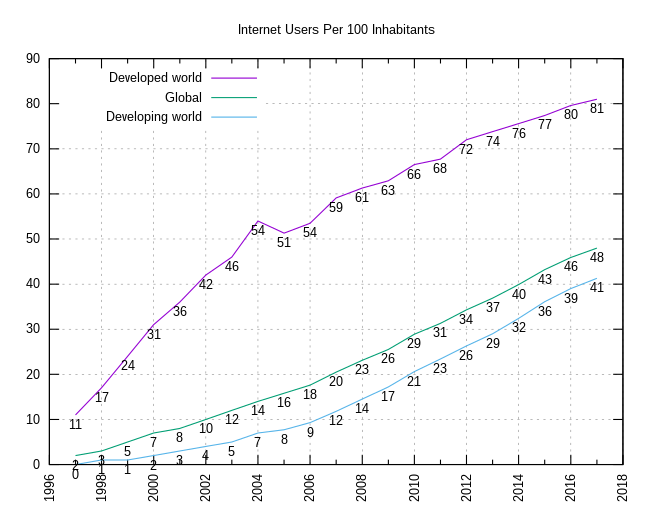 As of April 2019, 56.1% of the world's population has internet access, and 81% of the developed world. In 2015, the International Telecommunication Union estimated about 3.2 billion people, or almost half of the world's population, would be online by the end of the year. Of them, about 2 billion would be from developing countries, including 89 million from least developed countries. This map illustrates the total number of Internet users in a country as well as the percentage of the population that had Internet access in 2011. Source: Information Geographies at the Oxford Internet Institute. This map presents an overview of broadband affordability, as the relationship between average yearly income per capita and the cost of a broadband subscription (data referring to 2011). The Web Index is a composite statistic designed and produced by the World Wide Web Foundation. It provides a multi-dimensional measure of the World Wide Web’s contribution to development and human rights globally. It covers 86 countries as of 2014, the latest year for which the index has been compiled. It incorporates indicators that assess the areas of universal access, freedom and openness, relevant content, and empowerment, which indicate economic, social, and political impacts of the Web. 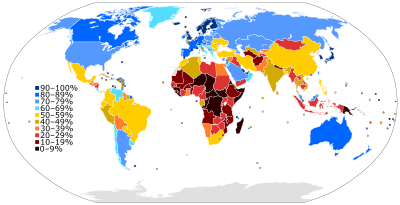 Map showing the score of the countries included in the Web index. The Carna Botnet was a botnet of 420,000 devices created by hackers to measure the extent of the Internet in what the creators called the "Internet Census of 2012". World map of 24-hour relative average utilization of IPv4 addresses observed using ICMP ping requests as part of the Internet Census of 2012 (Carna Botnet), June - October 2012. Key: from red (high), to yellow, green (average), light blue, and dark blue (low). Sources: Freedom on the Net, OpenNet Initiative, Reporters Without Borders. ^ "World Internet Users Statistics and 2016 World Population Stats". ^ "Internet used by 3.2 billion people in 2015". 26 May 2015 – via www.bbc.com. ^ "Individuals using the Internet 2005 to 2014", Key ICT indicators for developed and developing countries and the world (totals and penetration rates), International Telecommunication Union (ITU). Retrieve 25 May 2015. ^ "World Telecommunication/ICT Indicators Database". data.un.org. World Telecommunication/ICT Indicators Database. ^ "Internet Population and Penetration 2011", Information Geographies at the Oxford Internet Institute. ^ "ICT Facts and Figures 2005, 2010, 2016". Telecommunication Development Bureau, International Telecommunication Union (ITU). Retrieved 2015-05-24. ^ "Broadband affordability", Information Geographies at the Oxford Internet Institute. ^ "Web Index 2014 data". World Wide Web Foundation. Retrieved 5 April 2017. ^ "Web Index – taking a break in 2015". World Wide Web Foundation. 24 November 2014. Retrieved 5 April 2017. ^ Stöcker, Christian; Horchert, Judith (2013-03-22). "Mapping the Internet: A Hacker's Secret Internet Census". Spiegel Online. ^ Kleinman, Alexis (2013-03-22). "The Most Detailed, GIF-Based Map of the Internet Was Made By Hacking 420,000 Computers". Huffington Post. "ICT Data and Statistics", International Telecommunications Union (ITU). Internet Live Stats, Real Time Statistics Project. Internet World Stats: Usage and Population Statistics, Miniwatts Marketing Group. "40 maps that explain the internet", Timothy B. Lee, Vox Media, 2 June 2014. "Information Geographies", Oxford Internet Institute.